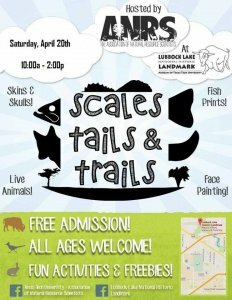 ANRS is hosting the 6th Annual Scales, Tails, and Trails.STT is a fun, family-friendly event at the Lubbock Lake Landmark. There are indoor and outdoor booths along the boardwalk with informational and interactive themes, such as fish prints, face painting, gardening, telemetry hide and seek, prairie dogs, astronomy and much more. It is a great way for families and young children to learn about wildlife, science, nature, and nutrition. It also is an opportunity for graduate and undergraduate students to give back to the community by encouraging a curiosity for the natural world among Lubbock’s youth.